The Old Church, Helsinki, originally uploaded by Brin d’Acier. This wooden church was built in 1826 to serve as a temporary structure while the older cathedral was demolished and a new stone church was built to replace it. The architect was Carl Ludvig Engel. He was responsible for most of the neo-classical buildings in the historical centre of Helsinki. 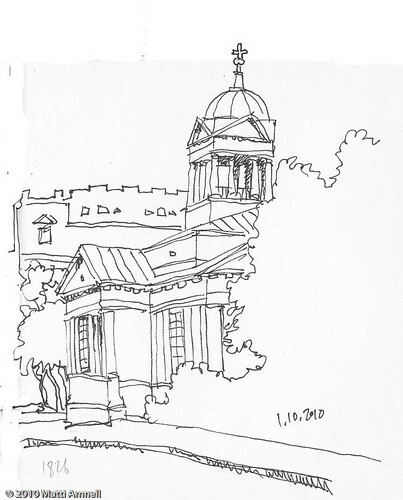 It’s almost impossible to draw this church from the front in the summer because of the big trees. It’s the same “Plague park” as here and here. Is this the church in Bulevardi? I love the little park around the church. I love Helsinki. Yes, you recognised the church. Here it’s seen from the Lönnrotinkatu side.